Mercure Bursa Thermal & Spa Hotel is located in Cekirge district at a walking distance to the prominent high society area of the city, Ataturk Museum and Kultur Park. We aim to offer you a comfortable place with a full view of the valley of Bursa. Modern decorated rooms offer a seamless blend of comfort and technology. Old City, historical attractions and typical city bazaars with antics, souvenirs and famous textile products, BUTTIM Congress and Fair Ground are just a few minutes drive from the hotel. 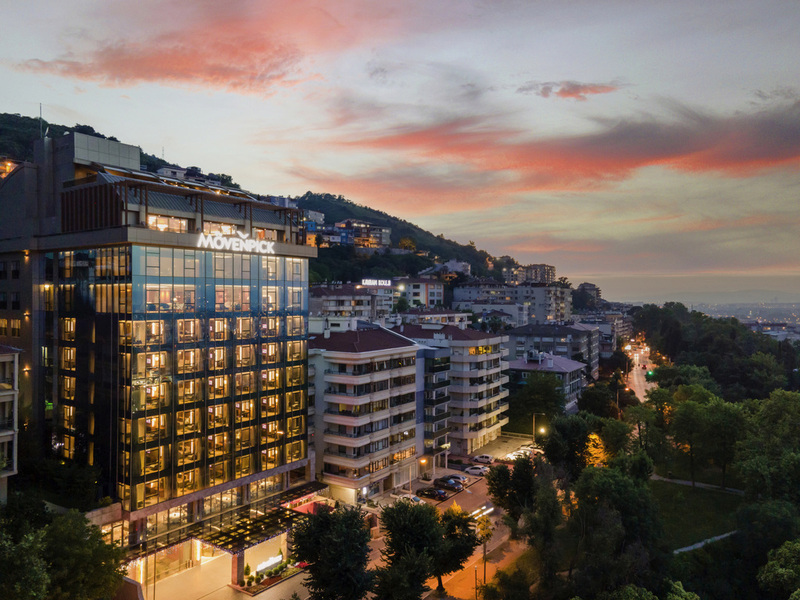 Mercure Hotel Bursa into the city of center. Close to shopping malls and cultural park. Mercure Bursa Hotel restaurant serves inhouse and other guests lovely local and international dishes during the day. The restaurant is open for breakfast, lunch and dinner. Mercure Bursa Hotel bar serves inhouse and other guests lovely local and international drinks. Personnel was very kind, cleanness and service was perfect, eats and everything was in good quality. The only thing is we were with our 4 year old child, there was no area for her to spend some time. Please send the electronical invoice to st… Otherwise it was an excellent experience ! Spa person was so related, breakfast should be better, thanks for your hospitality. From the moment we arrived to our departure we were well taken care of by the staff. It is a very true 5 star hotel. We had a wonderful room. We opted for a larger room with a king bed rather than the view room. The breakfast and the three restaurants were nicely decorated. We totally enjoyed the roof restaurant and the breakfast venue. We enjoyed massages and soaking in the 40 C waters. Each day we took a 5 minute taxi ride into the center to see the sights and to shop in the markets. We thank the entire hotel staff and give a special thanks to Kunsat in the breakfast room. I travelled together with my brother last weekend as we wanted to scape from Istanbul to ski in Uludağ. We considered to stay on the mountain, but finally we decided to book a recognized brand hotel in Bursa in order to have some more night life too. I have to say that this was the best choice we could have ever done for many reasons: -it took us less than 10 minutes every morning to get to the funicular to go up the mountain paying 75 turkish lira (go and return). -we booked a basic room and it was wide (about 30-35 sq meters) and plenty of amenities. - Nice SPA and gym. - great traditional restaurantl area 5 minutes from the hotel. - ALL the staff was great, 10/10, specially Misses Ayşe, Front Office Manager who helped us with anything we needed. - Restaurant a la cart da Vittorio in the hotel was amazing too: food very taste, delicious desserts and even better attention from his Director Mr. Vittorio. I will recomind this hotel and definitely I will be back! The staying experience was pleasant and hope to repeat it in near future. Thank you very much for the great hospitality. We really like the hotel - it is very clean. We are extremely satisfied from the food and the restaurants and from the service in the restaurants. We use all the facilities and procedures in the SPA center and it was great. The only remark we have is for the Reception desk because the check-in of the group was difficult and slow no matter of fact the we sent the rooming list 10 days before in english. To avoid this for future accomodations please give the rooming list to the guide for cooperation because the list of the hotel was only with Surnames but some of them are the same. The Guide knows the tourists and may help. Please for the next groups your reception desk personel not to blackmail us for deposit in front of the tourists. This we can arrange after the accomodation of the group. It`s not a problem. We will come back in the hotel with many gorups and I hope we will cooperate together very well! Thank you one more time for the hospitality! Every guest was very satisfied. Best regards! It was a good time to be your guests. Very good service, but not enough good air freshener. My room smell bad. Mercure offered the best service during our stay. We couldn't have been happier. All the staff were helpful, kind and positive. The room was spacious and the bed was comfy. It was an amazing experience. Wouldn't think twice. +++ spotless clean, kind staff, good restaurants, lobby Cafe with good books, mix thermal and Turkish Hamam. --- I would appreciate if I was offered a room from the front, it is hardly possible that it was the last room available in the Hotel that Reception told me, I was placed the first floor and back of the hotel without any view, Literaly the worst room, although I asked for the opposite and ready for room upgrade. Still I dont want to give wrong impression, the hotel and staff are great considering the price/location/benefit.